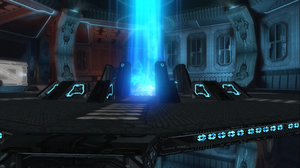 The Index Chamber in the Library of Installation 04 in Halo: Combat Evolved Anniversary. The Index Chamber is a large room within the core of every Library on each Forerunner Installation. Every chamber contains an Index, and is the most heavily protected area in any of the Installations. Intruders are met by Sentinels, who are programmed to keep the intruders from violating the Index Chamber Enforcers and Aggressor Sentinels were also seen protecting Installation 05's Chamber. The Index is the storage area of the repository of all Forerunner knowledge and study of the Flood. The Index itself is a T-shaped object of similar size to a human forearm. It is both a store of information and the key in activating the Installation it was designed for. At the very center of the Index Chamber is the Index, suspended in mid-air by an anti-gravity device, seen with a glow around it. It can only be reached via a vast anti-gravity powered lift that remains docked four levels above the floating Index. This lift requires the authorization of the Installation's Monitor in order to be activated, starting the process of retrieving the Index and the final act of activating the Installation and killing every sentient being within range, in order to prevent the spread of the Flood. The Index Chamber of Installation 04 was at the center of a massive underground security facility. This facility was protected by large groups of Sentinels and security doors. Many of the Flood used ventilation shafts and access tunnels to quickly escape and also infest the entire structure. Even the Index Chamber was contaminated, with a large group of Flood combat forms lying in wait inside. Following the containment protocol, 343 Guilty Spark led the Master Chief through the Library and to the facility, where he retrieved the Index. Spark then transported them both to Installation 04's Control Room. The chamber was destroyed in the subsequent destruction of Alpha Halo when the Master Chief detonated the UNSC Pillar of Autumn's engines. The Index Chamber for Installation 05 is actually situated at the ending of a series of Forerunner gondolas. The Index Chamber itself has no walkway or energized bridge but rather a chasm and opening with no particular pathway or raised podium to stand on. This affirms the Forerunners' style of placing challenges before any Reclaimer could attain the Index from its location, as Miranda Keyes had to take hold of a Flood tentacle to retrieve the Index. It is also possible that without a Monitor, proper access to the Index was impossible. The Index Chamber is protected by fields and arenas known as the Quarantine Zone, where Aggressor Sentinels, and Enforcers are seen defending the area from the Flood. In the year 2552, the floor of the Index Chamber is seen shattered and almost completely destroyed. It is possible that the Flood were responsible for its destruction. In Halo: Combat Evolved, there is a glitch where the player can jump to the bottom of the Index Chamber and survive. In the beginning cutscene of the level The Library, the container holding the Activation Index unlocks, revealing it for two seconds before the animation by what is seen appears to have restarted since the Index seems to disappear as if the container was never even opened. This might have been caused by a scripting error. In Halo 2, the Gravemind was located directly under Installation 05's Index Chamber. When the Arbiter Thel 'Vadam fell from the platform, he was saved from certain death by one of the Gravemind's tentacles. Top-down view of the Index Chamber in Halo: Combat Evolved. Master Chief retrieving the Index.